Although he was counted amongst Mily Balakirev's 'Mighty Handful' (which dedicated itself to pursuing a more purely Russian art music, as opposed to the Austro-German musical dominance of the era), both works on this recording show how Nikolai Rimsky-Korsakov was able to draw influences from beyond Russia into his own unique compositional approach: the scenes from his opera The Invisible City of Kitezh take on a dramatic, Wagnerian influence, whilst Sheherazade is suffused with orientalism as it conjures images from the Thousand and One Nights. 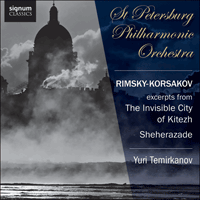 The St Petersburg Philharmonic Orchestra and Yuri Temirkanov bring their natural insight with this repertoire to the fore in these live performances, continuing their series of acclaimed releases with Signum. Had I ever studied at all, had I possessed a fraction more knowledge than I actually did, it would have been obvious to me that I could not and should not accept the proffered appointment, that it was foolish and dishonest of me to become a professor…I was a dilettante and knew nothing. The older, wiser Nikolai Rimsky-Korsakov recalling his acceptance of the professorship of composition and orchestration at the St Petersburg Conservatory in 1871. Once installed, the position proved a steep learning curve as the young composer found himself having to learn of the most basic musical conventions and traditional musical training from his own pupils—‘having undeservedly become a Conservatory professor, I soon became one of its best students’. By the time he was offered the position, the 27-year-old Rimsky-Korsakov was already celebrated as a most innovative orchestrator, by virtue of the brilliance of his early works in the genre, Sadko and Antar. However, his natural talent had received no real thorough-going compositional guidance in his early years, save the odd tutor and the rather bizarre methods employed by his single mentor of note, the esteemed composer Mily Balakirev. Despite musical leanings as a child, Nikolai was sent to Naval Cadet College in St Petersburg, where, his studies aside, he was able to attend opera and concerts in the big city. In 1862 he was called to Naval duty and toured for the next three years as midshipman on the military clipper Almaz, visiting London and Rio de Janeiro among other places, whilst studying Berlioz’s treatise on orchestration, buying scores (and even a piano on which to play them) and devouring the classics of literature. However, after a time the exoticism of his travels and extra-musical activities led him to somewhat neglect his musical studies. Returning home in 1865, music again loomed large in Rimsky-Korsakov’s life, as did a cluster of composers soon to be dubbed (not entirely seriously, it seems) as ‘The Mighty Handful’ or ‘The Five’. Under Balakirev’s often despotic leadership the group, which included César Cui, Modest Mussorgsky and Alexander Borodin as well as Rimsky-Korsakov, dedicated itself to the progress of a more purely Russian art music, and was determined to challenge the Austro-German musical dominance of the time. Their starting point was naturally Mikhail Glinka whose opera, A Life for the Tzar had effectively kick-started a native Russian school of classical music. ‘The Mighty Handful’ took the music of Glinka and Alexander Dargomyzhsky as their starting point, employing aspects of Slavic and Russian folksong and folklore characters as well as inflections from the music of the Orthodox Church. Avowedly anti-conservatoire in their stance, it was a blow to the group when Rimsky-Korsakov accepted his professorship—a move which Balakirev, in particular, found difficult to stomach. Nevertheless, the young professor immersed himself in academia, largely setting aside his own creative urges for a handful of years in the 1870s and 80s in order to gain the tools that would see him emerge a composer secure enough in his technique to more effectively communicate his ideas. These ‘dry’ years were also products of a lack of self-confidence, no doubt due to his late conversion to academia, and he was ever-after obsessed with revising his own works. He was also of immense value in revising, completing and editing the works of other composers, and was often of invaluable help to the reputations of his former colleagues in ‘The Mighty Handful’ in this fashion. Mussorgsky’s Boris Godunov and Borodin’s Prince Igor are just two of the unfinished operas that Rimsky-Korsakov prepared as editions—and unusually for his time, he archived the original materials from which he worked, so that they might be inspected or re-interpreted in the future. Other projects which fed the composer’s musical imagination in the 1870s included editing Glinka’s operas, orchestrating Dargomyzhsky’s The Stone Guest, and transcribing and harmonizing two collections of folksong—this latter task being of particular use in the understanding of Russian folk idioms. His knowledge of the orchestral palette was further enhanced in 1873, when the navy created a post for him as their band inspector. The position afforded him the freedom to delve deeper into the sound-world of wind instruments, a good many of which he learned to play, and an experience which can be heard to wonderful effect in the composer’s output.